A few weeks ago I was following a discussion on LinkedIn. People were discussing what a writer should do when they feel that they’ve hit a wall, when they feel that they need to write, but they don’t know where to start. One of my contacts made an awesome suggestion: “Search for a great quote, and just go from there”. I found this to be very helpful advice. First, I love great quotes, so just searching them and seeing new ones is very enjoyable for me. Second, this advice is right up my alley. The hardest thing in writing is taking the first step. Starting with a pre-existing quote means that someone has provided you with the first step. The quote I will be working with is the quote that I posted on the top of the article; “Knowledge is knowing that a tomato is a fruit, wisdom is not putting it in a fruit salad”. People often confuse wisdom and knowledge. Whilst they are in the same “family” they are not synonyms. In the work that I do with my clients, very often I find myself trying assist them with differentiating between knowledge and wisdom. Knowledge is defined as ”the fact or condition of knowing something with familiarity gained through experience or association”. Knowledge is really about facts and ideas that we acquire through study, research, investigation, observation, or experience. I like to refer to wisdom as “Knowledge 2.0”. Wisdom is the ability to apply that knowledge to the greater scheme of life. Applying this back to the original quote, my knowledge tells me that a tomato is a fruit. But what do I now do with that knowledge? How do I apply that knowledge into my life? If I am a greengrocer, do I now put my tomatoes between my apples and oranges for sale? If I am a chef, what type of salad do I add tomatoes to? Wisdom is knowing that despite its classification as a fruit, it is eaten amongst vegetables. Wisdom tells the chef to put it into a salad with cucumbers, lettuce, peppers and carrots. Wisdom tells the greengrocer to place his tomatoes next to the onions and radishes. There is a famous phrase that a little bit of knowledge can be a very dangerous thing. I would like to amend this slightly, Knowledge without wisdom can be a very dangerous thing. It can be extremely harmful for someone to have knowledge, without knowing its proper application. A person should train themselves to realize that there are two levels of “KNOWING”. Problems often occur when a person at “Level 1” believes that they are on “Level 2”. Such a person will put tomatoes in a fruit salad, then argue with you for suggesting that they don’t belong there. 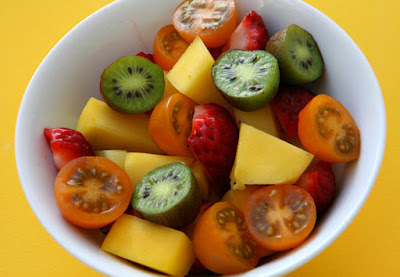 They will view themselves as the smart one for knowing that tomato is a fruit, and will think you are foolish for suggesting that a fruit be put into a vegetable salad. It is imperative for a person to realize that knowing a fact doesn’t mean that they know how to apply the fact. When a person is capable of opening their mind to the idea that there are two stages of knowing, they will improve both their overall knowledge (1.0 and 2.0) and their daily functioning.